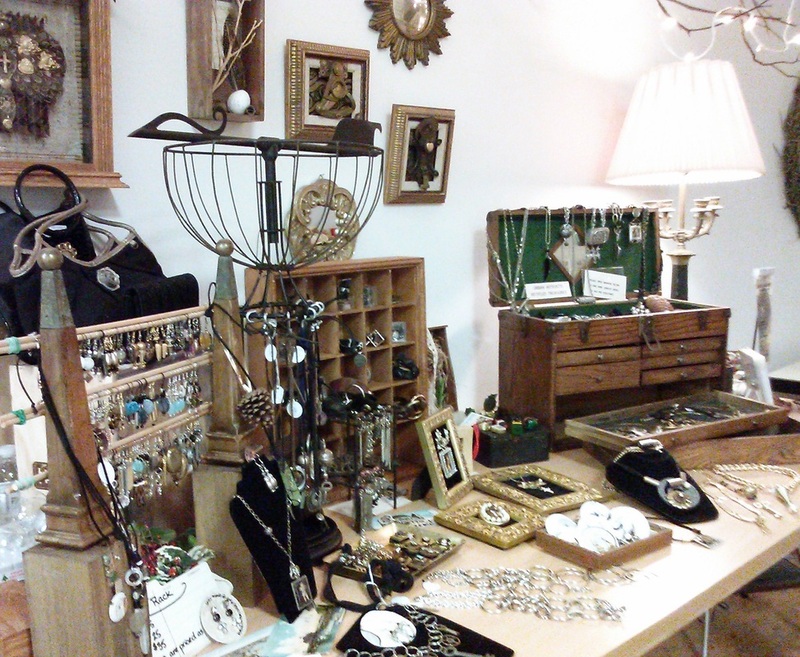 creative boutique, handmade products and participate in workshops and events. You can also contact us with the contact page on our site. Our Products: IT BEGAN WITH THIS IDEA! Robin Gilmore's MADE IN BRIDGEPORT jewelry collection is both creative and innovative, as she transforms everyday found objects into beautiful wearable works of art. Her Imaginative work is developed from recycled, repurposed and broken parts and pieces from objects found on the street, at thrift stores, salvaged hardware shops, vintage jewelry finds and from years of collecting things that are meaningful and unusual. Robin's creative designs are often complimented as true one of a kind statement pieces as they are unique and fun to wear. Many of the pieces are considered real works of art- amulets that become "Modern Myths", storytelling that is humourous, sentimental and insightful. Making something out of nothing is a re occurring theme in artist Robin Gilmore's life. Growing up in a family of factory workers in Bridgeport, CT and finding herself in industrial environments since birth , has served to peak her curiosity in the way things were made and how each part supported the process of the other…this created a genuine interest in design, industry and entrepreneurship. Her love of art began at an early age when she discovered its’ unique healing qualities as well as its importance in storytelling and self realization. “There is a story behind everything that we do whether we are conscious of it or not.” The creative process and her passion for the arts are her strongest motivators in her dedication to teaching, working with others and the works she creates. Her many talents have been utilized in various social service and educational agencies.- working with youth in crisis, the blind and deaf, young adults in transition, juvenile justice, pregnant teens and hosting an alternative education program for the City of Bridgeport, Board of Education. She has created venues for artists to exhibit their work and created cultural connections within the community . Robin conducts workshops that are insightful, enriching and just plain fun. 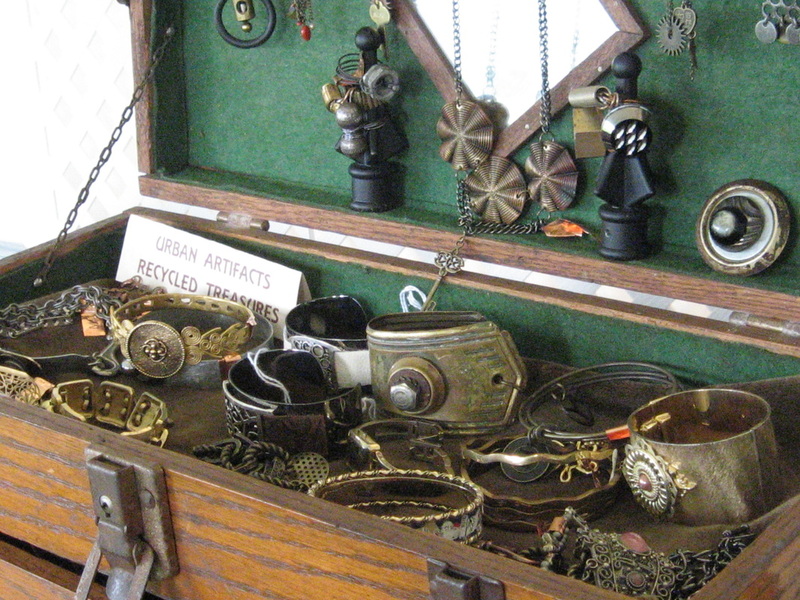 Her workshops in jewelry design, assemblage and mixed media contribute to the reuse of found objects current with the "GREEN" RECYLE, UPCYCLE Movement while enhancing the revitalization of The City of Bridgeport. Found objects are given a rebirth and made into functional art and wearable accessories. "The symbolism of a found object such as a rusty washer becomes the platform for adding to the textures and colors of my storytelling. My stories are as much about connections and spiritual life as they are about objects and everyday life". Made In Bridgeport is Robin's way of melding her roots and vision of art making with her history and the City of Bridgeport Connecticut's Post Industrial/ Arts Evolution.